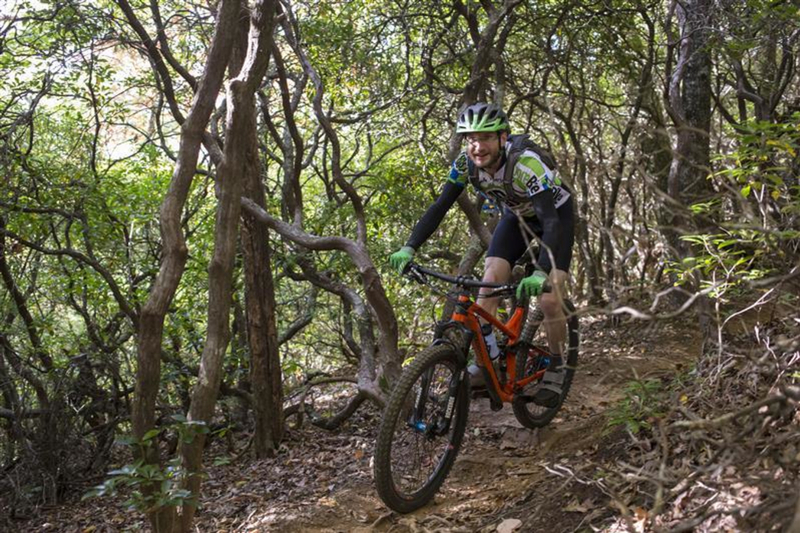 The “Big M” is a classic Pisgah mountain bike ride, a 12-mile loop featuring a great downhill on the Black Mountain Trail and the scenic singletrack of the Sycamore Cove Trail. The “Big M” is a classic Pisgah mountain bike ride, featuring a spectacular and rocky downhill on part of the Black Mountain Trail and the rhododendron-lined, rooty singletrack of the Sycamore Cove Trail. 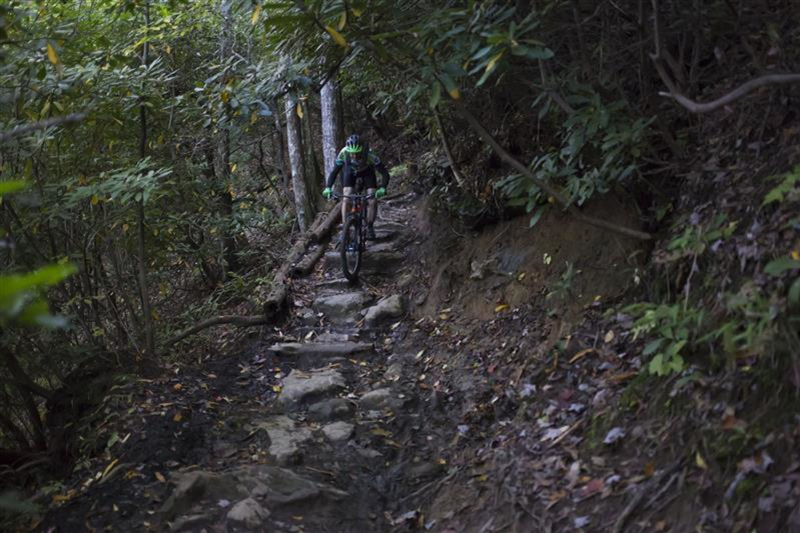 This 12-mile loop is only moderately technical in Pisgah terms, but the section of Black Mountain near Hickory Knob features several drops and staircase-like trail features that many riders will walk. 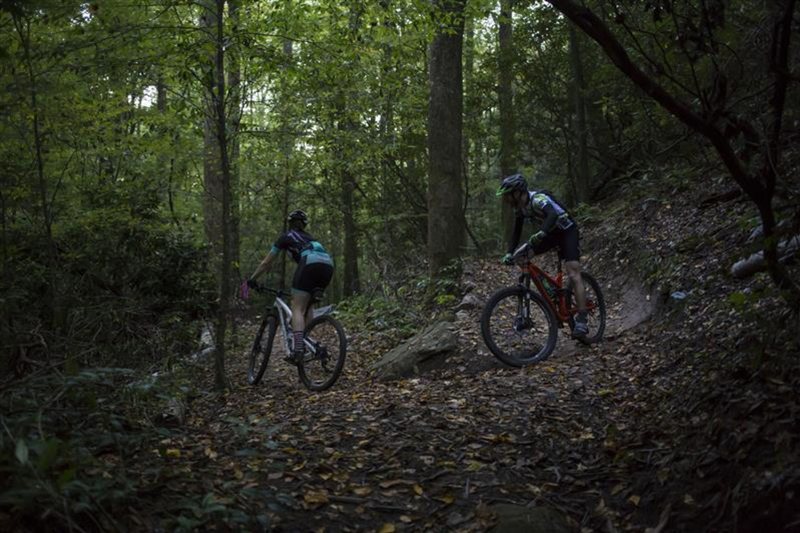 This one has everything that makes Pisgah mountain biking special: massive climbs, technical descents and lush forest scenery. It begins just inside the main Pisgah National Forest entrance, close to downtown Brevard, NC. It earned its distinctive nickname because the route makes the shape of an M. The left side of the M is formed by combining Clawhammer Road, Maxwell Road and the famous Black Mountain Trail; the right side is formed by combining Grassy Road Trail and Sycamore Cove Trail. 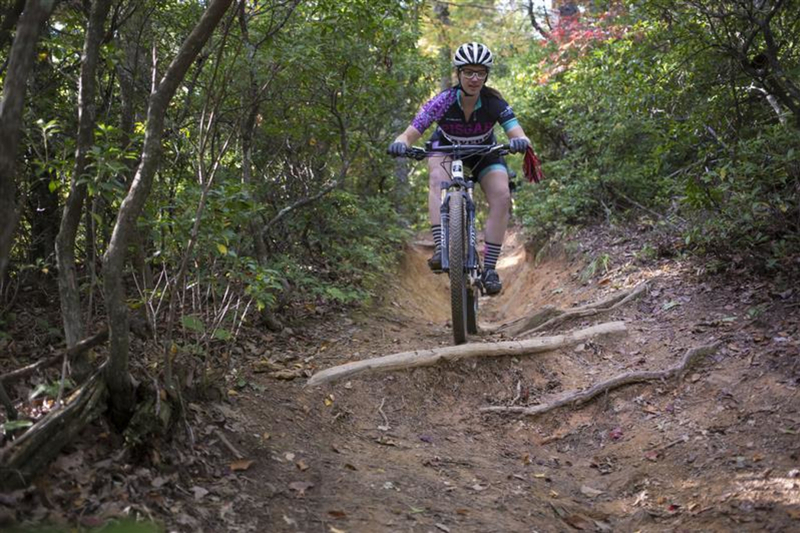 If you’re camping at the Davidson River Campground, you can start this ride right from camp! Starting at the Black Mountain Trailhead, which is the parking lot just before the Pisgah Ranger Station, make a right turn out of the parking lot onto the road (or take a left if you’re at the campground). After a brief ride on the pavement, follow signs for the Horse Stables and turn onto gravel road FS 477 (Avery Creek Rd on the map). Once you reach the stables, right into the parking lot, through the gate and onto the fire road (FS 5058) that climbs the hillside behind the stables. 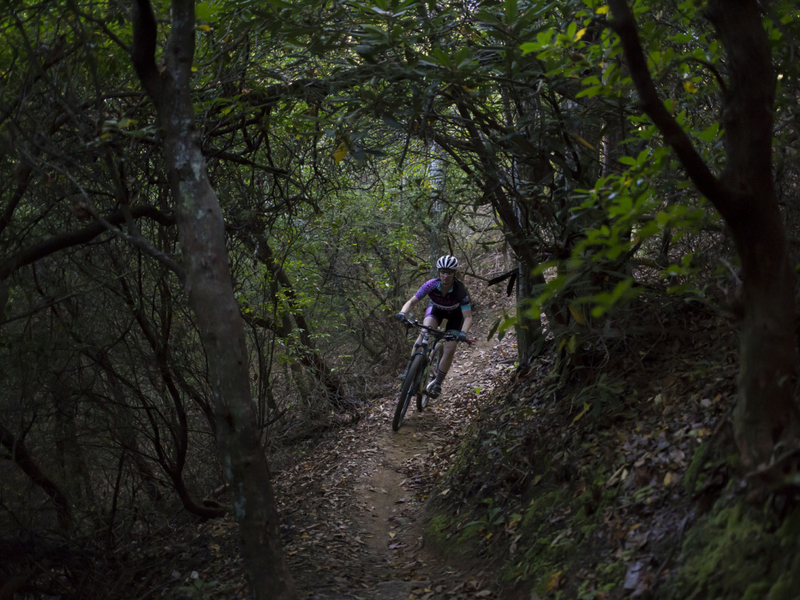 This is Clawhammer Road, and it begins the hour-or-so climb to Pressley Gap. Consider dismounting if you see people on horseback; some horses are afraid of bikers and can injure you or the rider. Stay on this gravel road for about fifteen minutes until you come to a right hand turn up Maxwell Cove road (FS 5098), then take it all the way to the gap. If you look closely on the right, you'll see that there is an old home site close to the top. The chimney is still standing, and there is a sign that is easier to see in the winter. 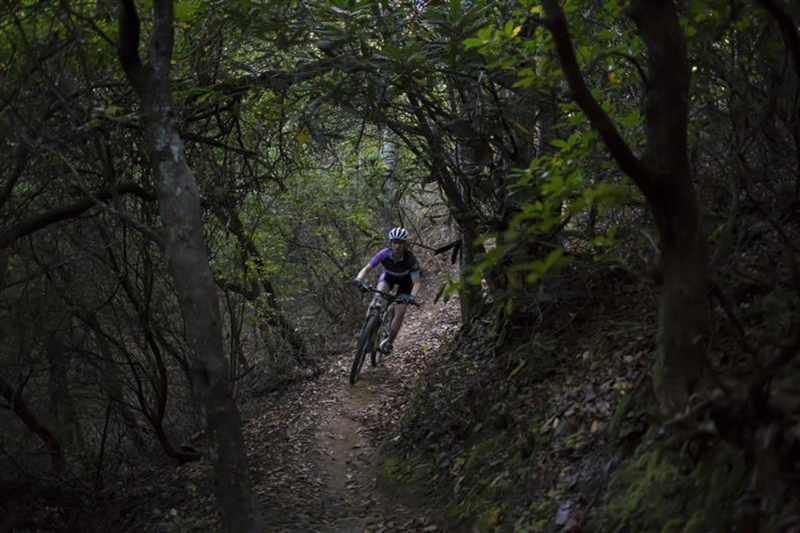 Once you reach Pressley Gap, make a right onto Black Mountain trail (#127) and climb to the top of Hickory Knob. This short climb is steep and rooty, and hard to clean (especially when wet); it’s a hike-a-bike for many people. There’s a small clearing at the top where you can lower your saddle if you choose. 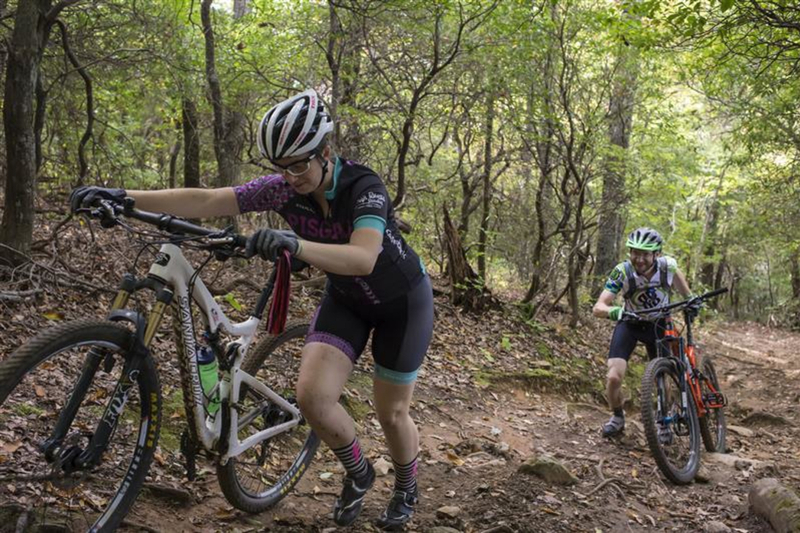 From there, the Black Mountain downhill is fast and technical, with lots of fun lines, drops, rocks, and rooty switchbacks. In other words, typical Pisgah gnar. Make good decisions, and stay within your skill set! Soon, the trail arrives at an intersection with Thrift Cove (#603), make this right and continue descending down Black Mountain. Both the steepness of the grade and the overall difficulty ease up a bit at this point. This is the new Lower Black, the subject of a massive Pisgah-Area SORBA renovation in 2014. 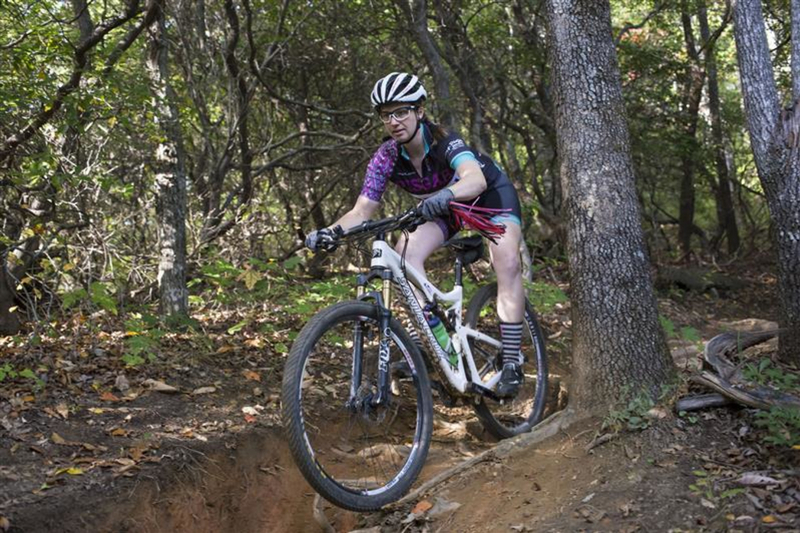 It’s fast and flowy, with some large berms and fantastic rock armoring. You’re closer to the ranger station here, so watch for other trail users. 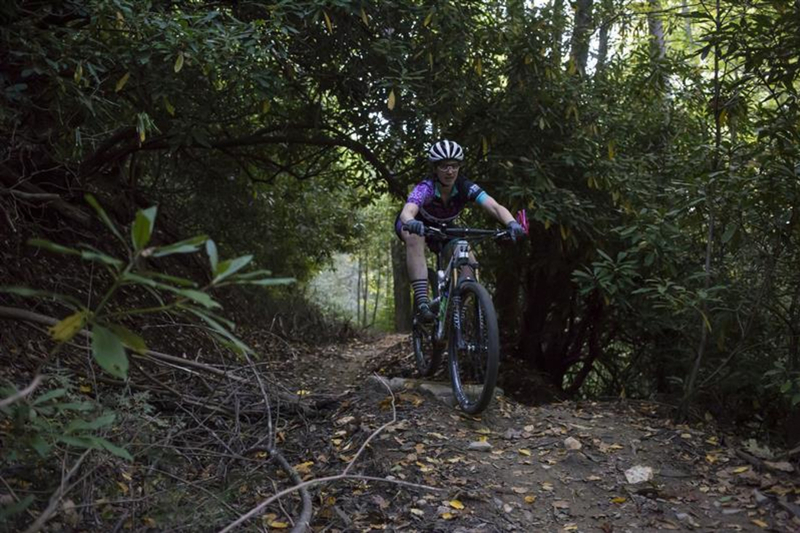 Remember, while this is one of the best mountain bike downhills in Pisgah, it’s also one of the most popular. The descent ends on a gravel double track that turns uphill; this is Grassy Road trail (#364). Climb uphill and bear right where the bottom of Thrift Cove trail intersects. After another fifteen minutes, Grass Rd joints with Sycamore Cove Trail (#143). Take a left onto Upper Sycamore, power your way up the tangle of roots and soon you’ll crest the ridge. Hold on tight! 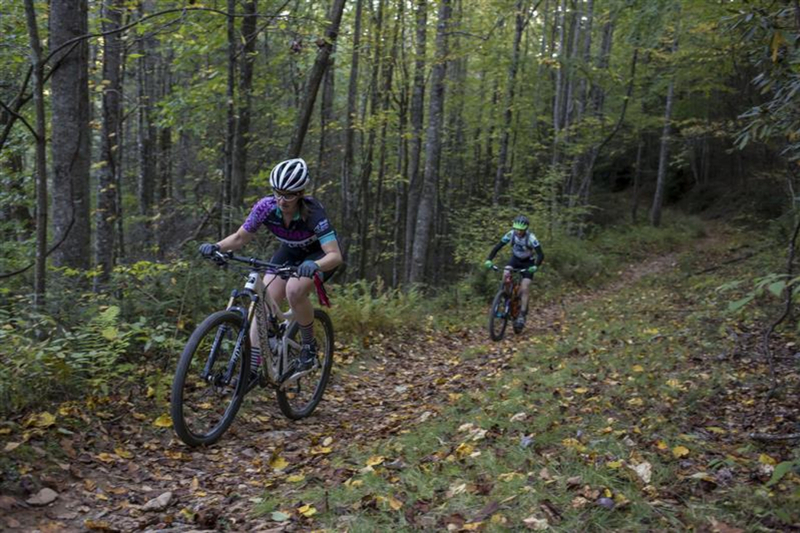 This is a screaming fast descent on narrow, bench-cut singletrack. It ends at the pavement you came in on, and your car is about 200 yards to your right. This ride takes you through a black bear sanctuary, so your chances of seeing one are better than almost anywhere else in the forest. Don't worry; they are more scared of you than you are of them! 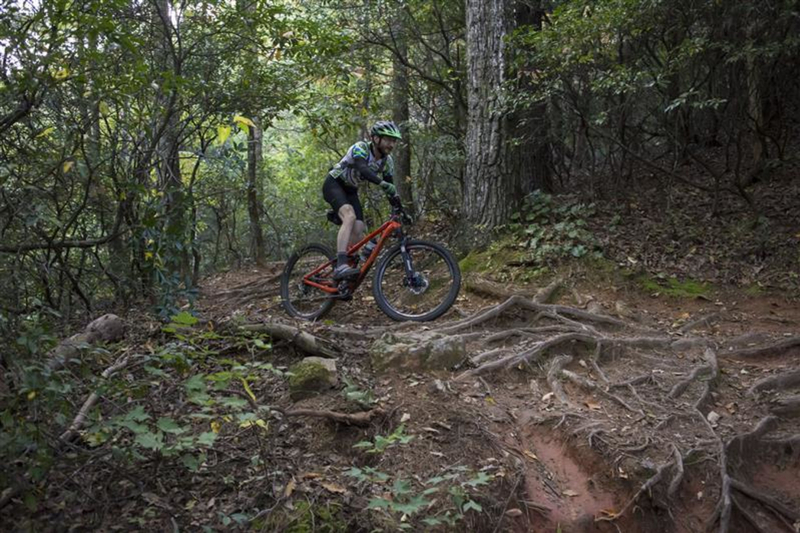 This 12-mile loop is only moderately technical in Pisgah terms, but the section of Black Mountain near Hickory Knob features several drops and staircase-like trail features that many riders will walk. 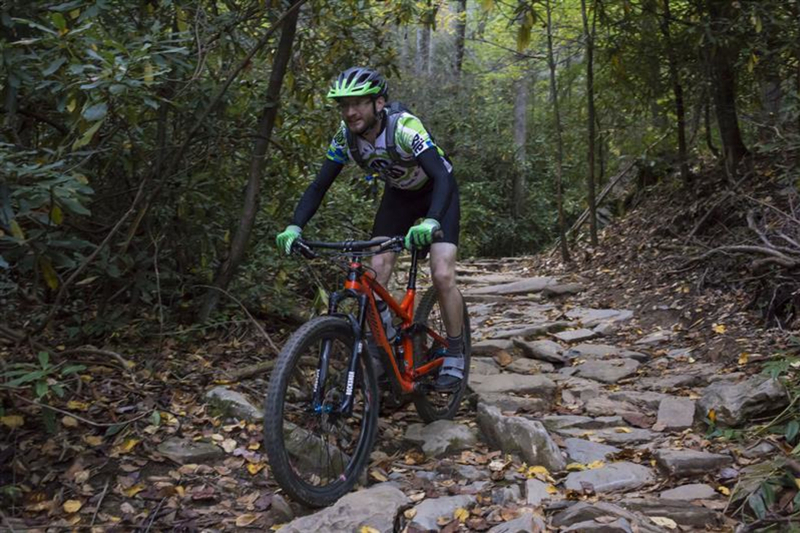 Start at the Black Mountain Trailhead, which is the parking lot just inside the main Pisgah National Forest entrance, before the Pisgah Ranger Station.